Need to create a poster or banner? The UPS Store can help with your large format printing jobs. Tell the world about your business. Whether you’re celebrating a grand opening, holding a special event or promoting a new offer, sale or discount, The UPS Store can help you create beautiful, bold banners and posters to communicate with your customers. Transform outdoor and indoor sales events and trade show displays with custom signage. 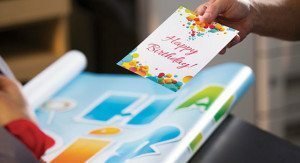 We offer vinyl banner printing and custom sizes to accommodate your message. We’ll even provide portable banner stands and grommets. Other options include roll-up vertical banners, magnetic signs, custom flags and teardrop banners. Brighten up a wall or window with a custom poster featuring your company logo and personal messaging. Posters can be printed on an assortment of paper and we can even handle the laminating and mounting. Some The UPS Store locations have a graphic designer on staff to can help transform your ideas into beautifully designed, professional posters and banners. Contact your local The UPS Store to find out which large format printing services are available and get your business posters and banners printed today!